The story and theme in this game does pays tribute to old giant robot animation from the late-70s and early-80s and that is pure awesome. The story and theme also feels very authentic to what they were paying tribute to, thus builds up a great atmosphere and makes you feel like that you are young again, watching cartoons early on a Saturday morning or every weekday morning at 7am (I miss watching Aggro's Cartoon Connection and Cheez TV). The downside to the story and theme is that it won't appeal to those that dislike older looking anime and/or cartoons. For the regular readers of my reviews, you are sure to find that the story might sound oddly familiar. The reason why is due to that the events that happen during this game are related to those found in another game I've reviewed , ARMED SEVEN (2015) and it was very interesting to see how different the two games are, despite being part of the same series. 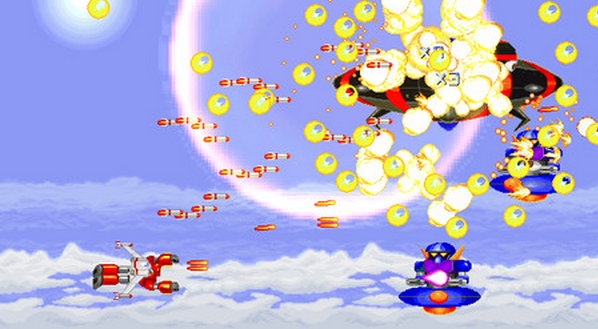 Gameplay is a simple arcade shooter where you are flying around the level and blast at enemies with your lase beams. The enemies won't go down without a fight as they will be blasting you with just as much (sometimes even more) firepower. Don't count Vulkaiser out just yet, this supercharged robot has some secrets up his sleeves, our hero also has a charge attack that can be done by just holding down the fire button until a little bar on the bottom of the screen fills up, then he'll fire his fists for extra damage. It does not take long to charge up your secondary attack at all and it'll feel very natural alongside your standard fire. The Vulkaiser also has a health bar and this is very nice to see and it gives you a chance to see what this game has to offer without you worrying about getting killed in one hit. The health bar can also take a bunch of hits and will also refill a little bit once you have beaten a stage. Once you are depleted of all your life bar, game over, you only get one life and no continues and this will turn off some players. There'll be some points in each level where your friends will pop-up in their robots to combine with you and make Vulkaiser even more powerful. The other forms of Vulkaiser includes: Thunder Kaiser, an electric type attacks that has a decent range but not as powerful attack. 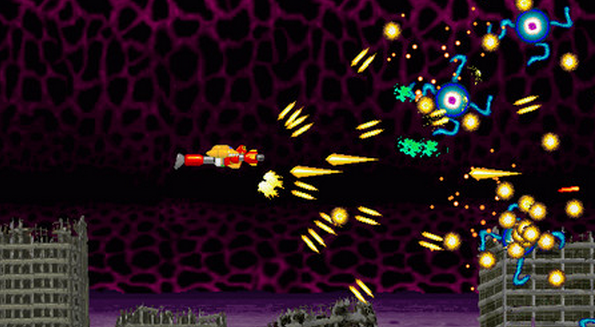 Drill Kaiser has you controlling a giant drill and is good for up close and personal attacks as it doesn't have good range, so you might want to avoid this if you are a beginner. Needle Kaiser has you shooting needles at a very fast pace with a really good spread, so you can hit a lot of things on the screen. Lastly we have Rocket Kaiser, this ability is all about power and has you firing loads and loads and loads and loads of rockets and missiles for if you want to take the Michael Bay approach to playing though this game. Combining with a co-pilot will also add another health bar to the Vulkaiser and that helps to make for as being as much as a shield as much as being a weapon. Be warned, once your co-pilot is out of health, you will not be able to re-combine with that pilot ever again. The health of the co-pilot will also regenerate a little once you have beaten a level and you will also get a nice dose of bonus points depending on how much health the co-pilots have by the end of the level. 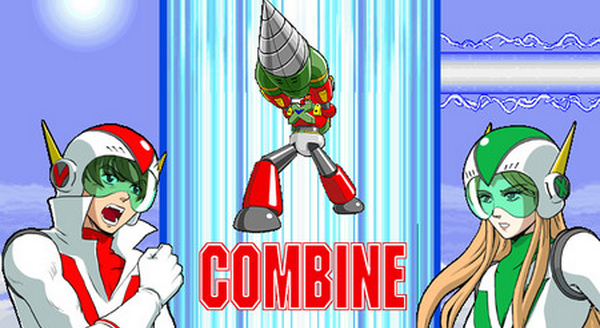 Combining with a co-pilot will also give you an all-new super powerful special attack that will do some crazy damage. You can only do the special attack one time per combination, so that means you can use it a few times per level depending on how many pilot combinations you make per level. I wouldn't go around wasting the special attacks as there will be dire times where you'll need them, so use them wisely. Also, once you have beaten a level you will get a neat little visual novel-esk cut-scene and it'll be different depending on which co-pilot you end the level with, that's if you choose to combine with a co-pilot as you can play though this game without having to combine with one but it's just easier if you do. The length of the game isn't very long, it's about the same length as an aracde game and so you can beat this game in about 20 - 30 minutes. The difficulty of this game can get quite hard and brutal but this game does have a range of difficulty settings that even includes an easy setting. This is a game that you won't beat on your first try due to the difficulty but with each time you play, the deeper you will get into the game. You can also save replays of all of your sessions and watch them when you want but only a select few players will use this feature. Because of the following that was said, this game ranks very high on the replay value spectrum due to the very fun but very challenging gameplay, so you'll be playing this one for hours.. Heck, I'm still playing this one to this very day. 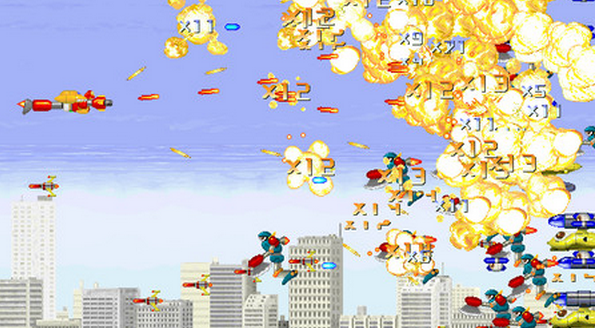 The controls in this game are incredibly simple as you'll use the arrow keys to move around, Z key to fire, hold in Z key to charge up secondary attack, and X key to launch the special attack. The controls are also very smooth and responsive, they especially work well with an arcade stick that can plug into the good old USB slot. My complaint about the controls is that there is no pause button and if you do try to pause by using the escape key, you'll just be sent to the game's main menu and that can get frustrating, especially if you are towards the end of the game and need to take a quick potty break. Graphics in this game are some of the most charming looking that I've seen this entire year and it captures the look of old 70s anime very well. I also love the presentation of the game as all of the cut-scenes also capture the feeling well. Another thing I found genius about the presentation is the translation, instead of replacing all of the Japanese writing with English, they instead add in English subtitles thus giving you the feeling of watching a subbed anime and that adds even more to the anime charm this game has. Animation in this game is not bad but also not great and it is what it is, I don't have any problems with it. Music and sound effects have an old-school sound to them and that blends in well with the game and I liked it a lot. The music and sound effects also have a very epic sound and it helped build up some atmosphere and also added in the feeling of urgency thus making your work in this game feel important. One minor problem was that the soundtrack did get a little too repedative for me and could've use some variety. Overall this game is a very fun and charming game that's bound to make fans of the old school (in terms of look and gameplay) very, very happy people. 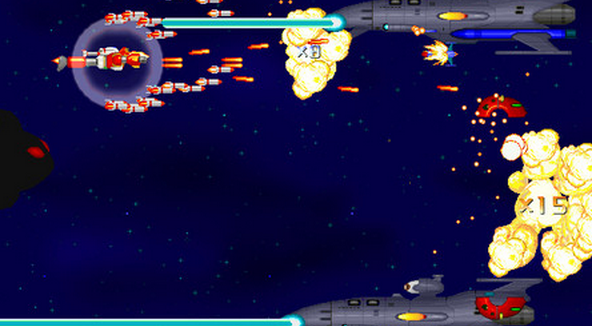 This game even appeals to those whom are not the biggest fans of bullet hell styled schmups due to the varayed difficulty settings. So far, this game is getting right up there as a game of the year canidate and is one that you should defiantly experience. Great game.